The Republic F-84 Thunderjet was an American turbojet fighter-bomber aircraft. Originating as a 1944 United States Army Air Forces (USAAF) proposal for a "day fighter", the F-84 flew in 1946. Although it entered service in 1947, the Thunderjet was plagued by so many structural and engine problems that a 1948 Air Force review declared it unable to execute any aspect of its intended mission and considered cancelling the program. 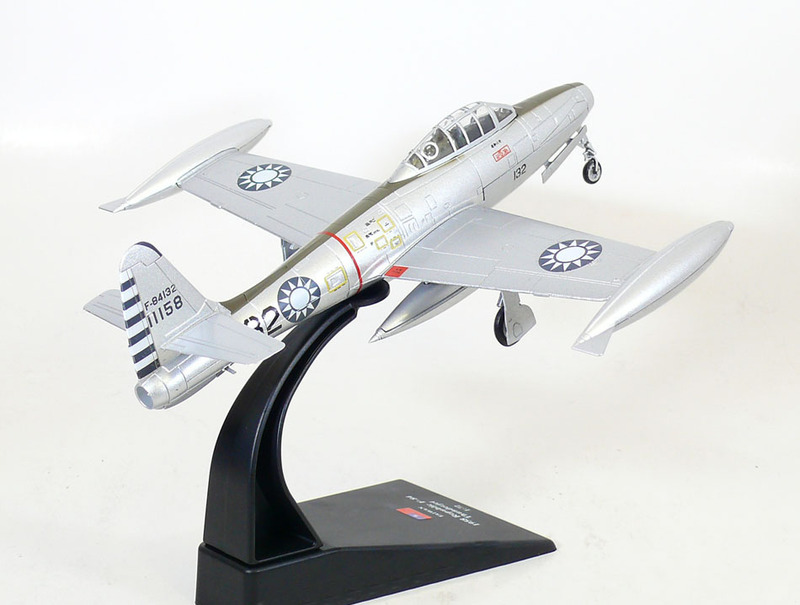 The aircraft was not considered fully operational until the 1949 F-84D model and the design matured only with the definitive F-84G introduced in 1951. In 1954, the straight-wing Thunderjet was joined by the swept-wing F-84F Thunderstreak fighter and RF-84F Thunderflash photo reconnaissance aircraft. The Thunderjet became the Air Force's primary strike aircraft during the Korean War, flying 86,408 missions and destroying 60% of all ground targets in the war as well as eight Soviet-built MiG fighters. Over half of the 7,524 F-84s produced served with NATO nations, and it was the first aircraft to fly with the U.S. Air Force Thunderbirds demonstration team. The USAF Strategic Air Command had F-84 Thunderjets in service from 1948 through 1957. The F-84 was the first production fighter aircraft to utilize in-flight refueling and the first fighter capable of carrying a nuclear weapon, i.e. the Mark 7 nuclear bomb. Modified F-84s were used in several unusual projects, including the FICON and Tom-Tom dockings to the B-29 Superfortress and B-36 bomber motherships, and the experimental XF-84H Thunderscreech supersonic turboprop. The F-84 nomenclature can be somewhat confusing. 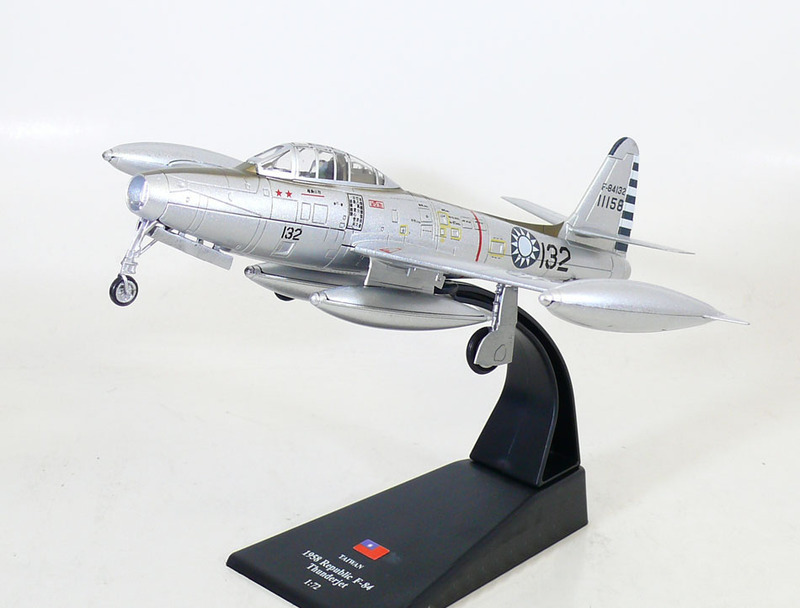 The straight-wing F-84A to F-84E and F-84G models are called the Thunderjet. The F-84F Thunderstreak and RF-84F Thunderflash are a different airplane with swept wings. The XF-84H Thunderscreech was an experimental turboprop version of the F-84F. The F-84F swept wing version was intended to be a small variation on the normal Thunderjet with only a few different parts, so it kept the basic F-84 number. Production delays on the F-84F resulted in another order of the straight-wing version; this was the F-84G.